Visage blinds are a hint of the Venetian look with a dabble of a Vision blind but fashioned on a Roller blind, and that is a Visage Blind. 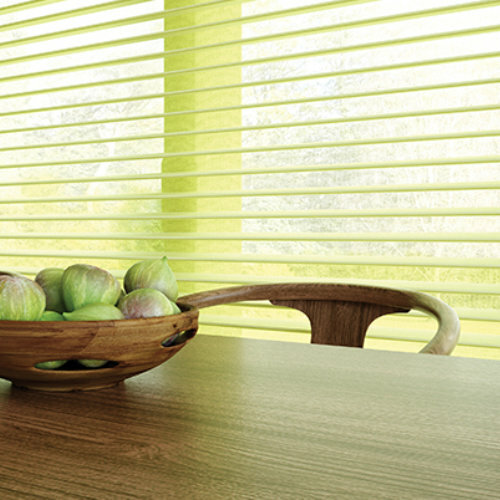 Visage Blinds bring a very contemporary look to any room, but it also brings a softness too. Made up of two layers of fabric that are brought together with a membrane of opaque fabric and depending which way they are tilted can produce the most stunning effect, open, closed or tilted to what ever degree you like. If you like contemporary styles, but still need a certain softness to complete your decor, the take a look at the Visage Range. Call in to the showroom or contact us to book an appointment in your own home.